Sorry about the lag in posting -- we've all been under weather, but much better now. Alvin's surprise on Tuesday was a really good one. 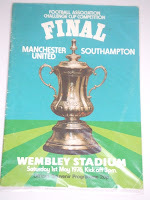 I bought (on eBay), the official program from the Southampton/Man United FA Cup Final in 1976. He got it on the 31st anniversary of the game. For those who don't know, this was the only time Southampton ever won the FA Cup. You only need to win it once we be engraved in history! ...that's because I'm almost 40"
"Happy Birthday to you... Happy Birthday to you... Happy Birthday Dear (Alvin, Daddy, Dude, Jonny Eight), Happy Birthday to YOU!"